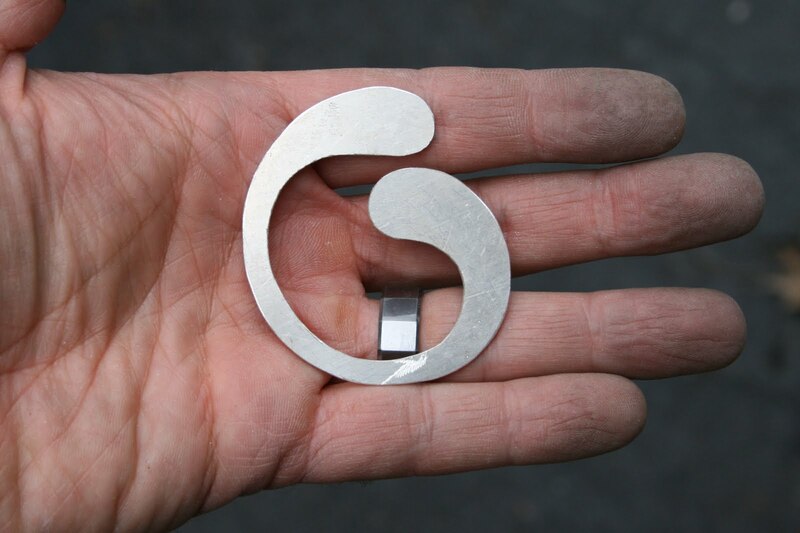 Here are some photos showing the process I used to create the pendant I designed in the last post. 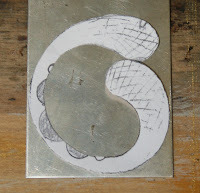 This first one shows the pattern cut out of paper and laid on the silver sheet. I then used a fine point Sharpie Marker to transfer the design. Then, so the design wouldn't be lost with finger smudges, I took an awl and scored along the line, making a permanent mark in the sterling. I then carefully cut out the shape using a jeweler's saw. I'm always surprised by how quickly this process actually takes. One would think that it would take lots of time and several saw blades, not to mention sore hands, but since sterling is relatively soft, it cuts right through. The piece as soon as it is free. You can see where I started each of the cuts. Try to keep these to a minimum, as you can see there is extra metal that now has to be filed away (and wasted) at each of those points (the bottom especially). After using my handpiece with green stones and white rubber wheels along with a variety of different files, here is the smoothed piece, ready to be knocked around a bit with my hammer. 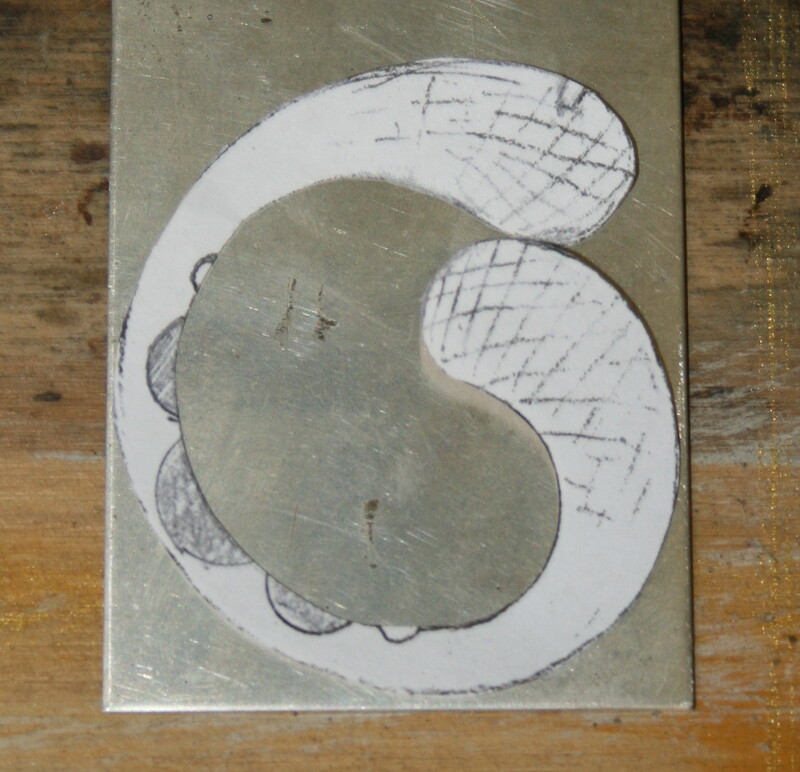 Right now it is very 2-D, and the design calls for a more 3-D shape, so I need to not only hammer in the texture, but I need to form it into a rather complicated curve. 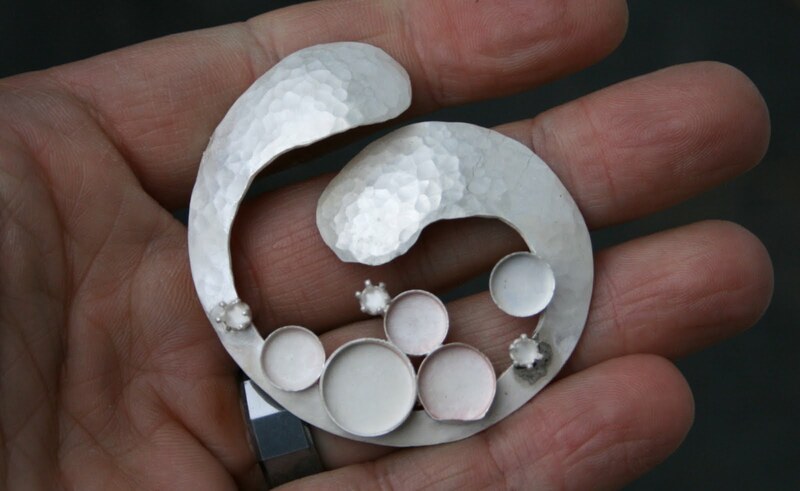 I say complicated curve because each one of the arms is curved and domed, as is the piece as a whole. I ended up hammering on my former models as well as an old 2x4, working to end up with the *PERFECT* shape. The next step involved soldering on all the settings for the stones. I used premade settings. There are three sizes of bezel cups, and 3 snap settings for 4mm CZ's. The trick was to set them successfully without melting the cups. Since the pendant base is large and relatively thick, it acts as a pretty significan heat sink, so it has to be heated thoroughly before any flame is directed onto the settings, or they will melt in no time. After a couple of hours in the pickle pot, the oxidation from the soldering process is gone, leaving a matte finish . It's now ready to set the stones. 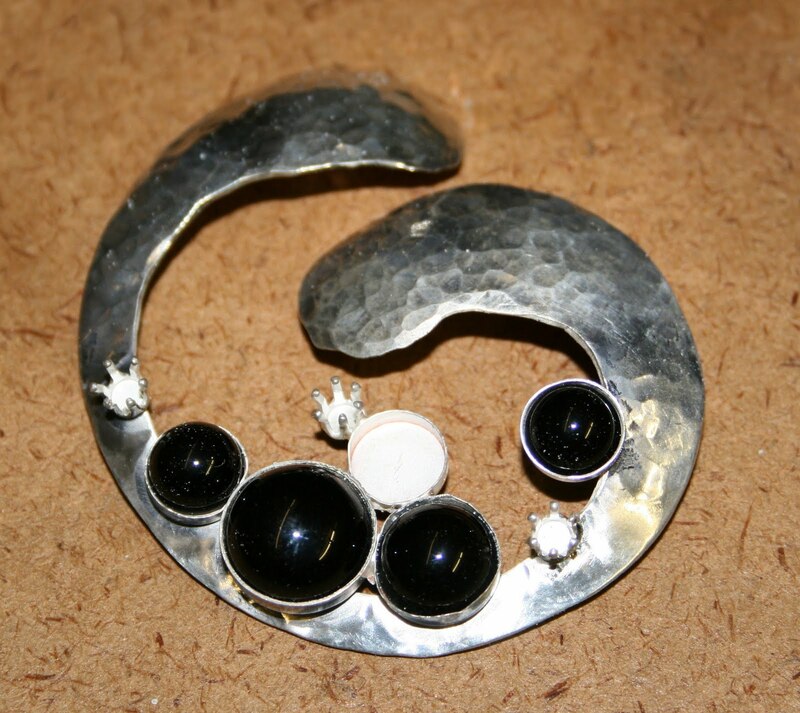 The onyx cabochons are set in their cups waiting to be set. The edges of the bezel cups had to be shortened somewhat so that there wouldn't be a lot of metal showing. Also, since I used high-domed cabochons, they were pretty steep, which would have made it difficult to bend/fold over that much metal without it creasing on itself and looking unsightly. After a nervewracking afternoon of cutting, setting, and a whole lot of polishing (I heard somewhere that the amount of time spent on polishing usually ends up being equal to the amount of time spend on everything else. I agree. 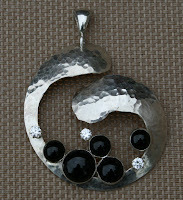 ), the pendant ended up a success. Next step? The earrings. About a month ago, I was approached by a woman in town looking for a unique gift. "Make it big and bold," she said. "Can you do that?" Are you kidding? I LOVE making big and bold. My opinion is that if you're going to bother wearing jewelry, then WEAR it! FLAUNT it! Don't be shy and put on something that no one is ever going to notice. The whole point of wearing jewelry, of collecting jewelry, of making jewelry, is for people to notice it; otherwise, why bother? The first part of a creative project is to find inspiration. This time, inspiration came during my son's haircut. I had just told the stylist to take a #2 up the back and sides and scissor the top so he could still spike it. Then I noticed her earrings. Big. Bold. (And nothing like the design, above.) All of a sudden, I saw this design in my head. This is it! 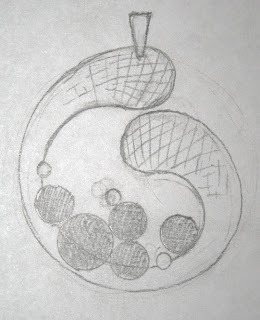 All those partial, foggy ideas which had been popping in and out of my head suddenly coalesced into this design. It was one of those weird, creative epiphanies you read about but seldom experience. Next, I drew the piece to size. The pendant measures about 2.25 inches (5.5 cm) in diameter, and the earrings are as big as a US quarter dollar. 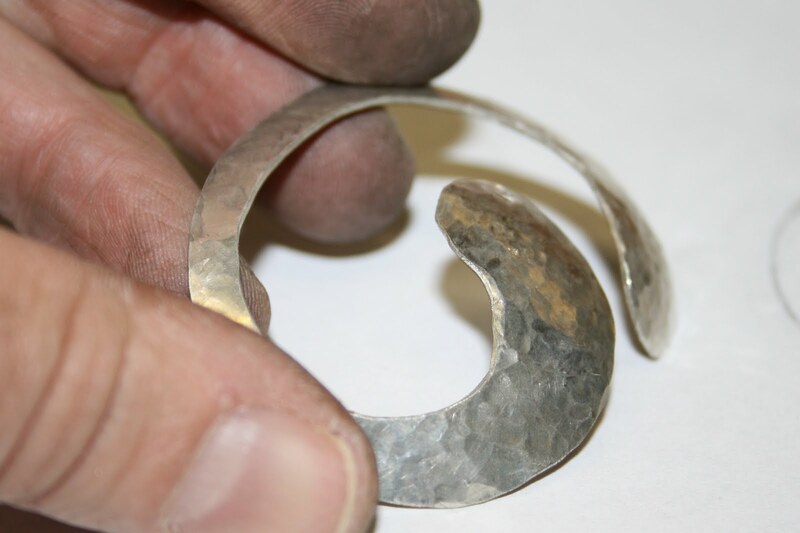 It's sterling silver, formed to give it some depth, and hammered at the ends to give it some texture. Then it will be set with 8mm, 10mm, and 12mm onyx cabachons (since black is 'her color'), and 4mm CZs (since real diamonds are not even an option). I plan to put an inscription on the back, too, but I can't tell you what it is, yet, as the recipient might guess, and that would be bad. 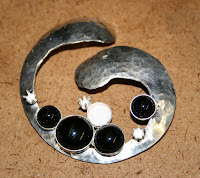 The earrings are pretty much the same, except the piece with the post will be a 12mm cabachon onyx. 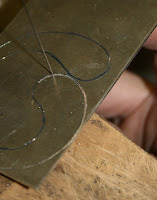 I'm thinking I may start with 12 guage wire rather than cutting out sterling sheet, too. 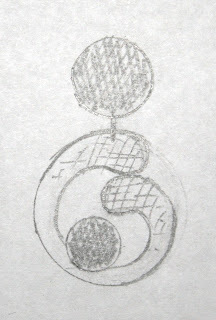 The shape is meant to symbolize protection, nurturing, and caring. The arms could be human arms protecting children, the walls of a pod protecting its seeds, or the petals of a flower protecting the stamens. I'm excited to start contructing this piece, and I plan to keep posting photos as I progress, so stay tuned! Wow. No new art to share. Sorry. I haven't even been making any jewelry! There are several factors on which I would like to place blame (after all, it's only human to place the blame elsewhere besides yourself!). First, Facebook. That is an evil, evil place. When I left home all those years ago, I RAN as fast as I could. Now I've reconnected with high school and college friends, and it's been really comforting to learn that our lives are a lot different, yet we are still friends after decades of not talking. Second, New Job. Being an Assistant Principal has a steep learning curve, one that I'm trying my best not to fall off. The take home work isn't so bad, but the extra time a school sure is! Third, Lack of Desire. I just haven't been motivated. I think it may be that I'm actually happy with my job now, and not trying to start a second career while still in my first. If anyone has some good ideas, please let me know! The above painting is the third one I've done in 2009. And since I've decided to keep the focus of my blog on my art, well, that's why posts are a little far and few between. The motivation for this work came from the gallery in St. Louis where I show my work, Gallery M. Susan, the nice owner over there decided for a juried show this fall called 'Beauty Is...'. I needed to get her some new work, so I went over to Tower Grove Park in St. Louis where they have gorgeous tropical waterlily ponds, and I took a bunch of pictures. One photo ended up on my laptop as wallpaper. Perhaps that can be a future post. We can put it up as a sort of challenge. What do you think? 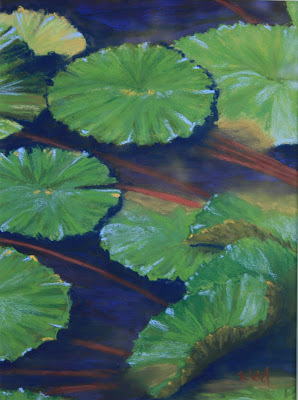 This is actually a small part of a much larger picture of white waterlilies. When i went to print off the whole file, it only showed this much. I was just about to delete the print job, when the composition struck me, and I was intrigued by the water, the curves of the pads offset by the straight lines of the stems. One person told me that it was too dark, but I like using my darkest pastels, sometimes. 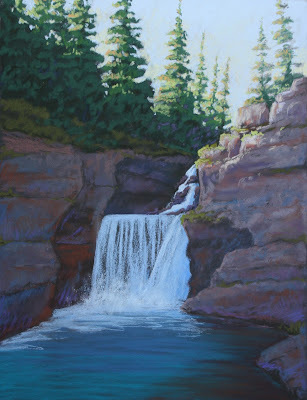 This was the first painting where I used Mineral Spirits to create an underpainting. I painted the water a very dark green/brown, and the leaves a yellow ochre. If i were to do it again, I think I would choose complementary colors instead. I think some red or orange showing through the leaves would be striking. OK, so it's not a painting, but it's what's been consuming my life for the past week. Literally. Picture this same room with dark teal green carpet and ugly peachy walls, and a ceiling that wasn't quite white. Now look at the white ceiling, the 'Plateau' walls, and the *new* bamboo wood floor installed by yours truly. I know the paintings are off center, but we moved the sofa and chairs around after the move-back-in, and I haven't re-moved the pictures. Besides, I think they'll go to my office after I paint a 30 x 80-inch painting for over the sofa. 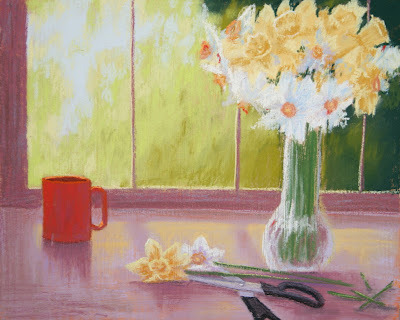 Morning Work pastel on panel 16" x 20"
Wow! It's been forever since I've posted. A lot has gone on... a new job for me and my wife for the 2009 - 2010 school year. I'll be the Assistant Principal for my building,, and she'll be Director of Curriculum, Instruction, and Assessment for her district. The black and white sketch that drew in my notebook turned out much better than the finished painting, I think. 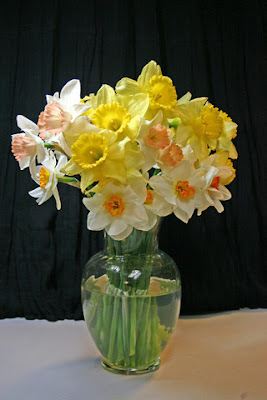 Once I had the daffodils drawn in, the vase looked to big for the flowers. I think it was the distance between the bottom of the bouquet and the place on the counter where i wanted it to sit was too far, so I had to change the style of vase. OK. Then it looked really blank, so I added my favorite coffee mug. It still looked empty, so I added the scissors. Then I made the mug bigger, since I really don't drink out of demitasse. All in all, it was intended to be a quickie, so the proportions aren't quite right, but I do like the lightness and airiness that it has. I can tell everyone is getting antsy for a new painting. I've lost subscribers to my blog, and no one is emailing me anymore. Well, here y'go. After a rather length vacation (yes, the project is finished - thank goodness! ), I'm back at my easel. The photo for this picture came from a fellow Etsy artist's blog. This picture presented some challenges. The biggest hurdle was keeping the waterfall and the surrounding rocks in a dark enough value range that the sunshine would be dominant. The original photo only had a hint of sun at the very top (and hardly any of the trees), so I had to make up the rest. This painting is a good example of how a color can look differently depending on what it's background is. The sun highlights on the rocks to the right are actually a light orange color, but on the purple, they, too, take on a purple color - weird, huh? I'm going to let it sit on my mantelpiece downstairs for a few days until I sign it. If you see anything that needs adjusting, let me know!